The successful London bid for the 2012 Olympic Games heralded tremendous business opportunities both locally and globally, but it was not without its criticisms. Whilst the London Olympic brand ‘set about to be highly inclusive, encouraging “access and participation”, to excite small businesses and bring about a greater sense of community within London,’ many local business’s claim the reality was a different story. As a result of the highly restrictive measures taken by the Olympic Brand Protection Committee (LOCOG) to prevent copyright infringement and ‘Ambush Marketing,’ ensuring total exclusivity to official sponsors of the event, local businesses were denied the opportunity to benefit from the immeasurable commerce that such an international event will inevitably bring. This controversy raises an important question; what can Rio 2016 learn from London 2012 with respect to delivering a high quality Olympic event, whilst ensuring inclusive local and global profitability which can be utilised to fund a sporting legacy? Should Rio comply with London’s highly criticized anti-ambush marketing measures? So, why are intellectual property rights so important in this context? Intellectual Property Law protects an individual’s property right in a diverse range of things from books, films, goods and services, whether it is in copyright, and trademark or patent infringement. We see brand names and slogans on products all the time, Coca Cola, Vaseline and Nike: ‘Just Do It’, to name a few, and they will no doubt be protected by these rights to ensure that no ‘knock off’ brand attempts to copy and essentially ‘free ride’ upon their established reputations. Intellectual Property Rights protect the Olympic brand and define it as unique, iconic and global, preventing it from being freely used by any individual without paying for that right. However, there are numerous ways of exploiting the legal framework of Intellectual Property Rights leaving little scope for the law to prevent them from doing so. This is evident in the phenomenon of ‘Ambush Marketing’. “Ambush marketing” is a general term to describe any unauthorised activity which attempts associate with an event without paying a sponsorship fee, therefore taking advantage of the goodwill attached with the event.’ This legal loophole is difficult to contain, for whilst some types of marketing do involve blatant infringements of copyrights, others remain subtle and operate within the law. This was evidenced in the July advertising campaign by Nike featuring Olympic athletes Paula Radcliffe and Mo Farrah. Brand exploitation was also in evidence at the Olympic Opening Ceremony where commentators drew attention to the Italian and American squads wearing Giorgio Armani and Ralph Lauren, respectively, despite the fact that neither were official sponsors nor had paid for the premium of being associated with the Games. One must be realistic regarding total exclusivity particularly during a period where the development of social media is ‘outpacing the legal protection sponsors are promised’. (6) It could be argued that since the loophole of ambush marketing is inevitable, such extreme measures employed by LOCOG are unnecessary and futile but without this uncompromising system, a relaxation in copyright law could result in a commercial free for all. LOCOG were particularly medieval in their crackdown to preserve the intellectual property rights that were guaranteed to those corporate brands who paid substantial premiums for the privilege of exclusive association with the Games. 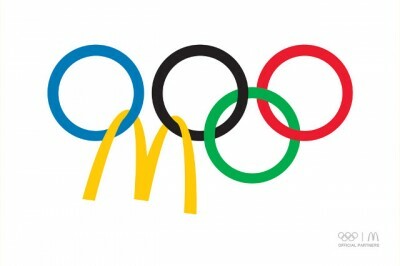 This limited use of associated symbols and wording to such an extent that, consequently, smaller local businesses, unable to satisfy the strict criteria expected to be fulfilled by an official sponsor or to provide the funding that corporate giants such as McDonalds had to offer, were denied the chance to take an active role within the spirit of the Olympics and profit as originally promised. Whilst this is true to a certain extent, such severe criticism has no doubt been exaggerated and fuelled by the media who have clearly failed to grasp the commercial importance of guaranteeing exclusivity. Contrary to general perception however, local businesses were encouraged to apply for tenders and received comprehensive support and step by step advice as demonstrated by official sponsor Lloyds Bank’s online guide ‘Your Business Journey to London.’ Although many more global companies then local were successful in meeting the stringent criteria of LOCOG, it is the integrity of this process that provides the sustainability of the Olympic brand and maintains the standards required to hallmark the event. Many smaller local firms were involved as sub-contractors to the major suppliers deriving collateral benefits, even though there name was not splashed on billboards. McDonalds was the exclusive retail food services and thus could be the only brand in that category to be seen at the Game Venues, however this did not mean that other varieties of unbranded food could not be sold. These international companies must be client focussed and ensure their franchise opportunities impact upon local business activity in terms of employment, regeneration and community at both a local, national and international level. The Commercial element of the London Olympic Games was commended as highly inclusive, encouraging participation on various levels ‘evoking a greater sense of community’. The severity of the London Organising Committee of the Olympic Games and Paralympic Games (LOCOG) approach may seem to challenge the spirit of the games with global commercialism but, it must be remembered that, although London is the focal point, the Olympics is a worldwide event and such sponsors have the currency to appeal to all, and ultimately generate vast amounts of income. In reality if you were abroad and had the choice between KFC and Al’s Fried Chicken, most of us are likely to go for the brand we know and trust. Thus, the protection of their investment and a guarantee of exclusive marketing rights are vitally important if they are to underpin the legacy of the games through their income generation. The official sponsors pay a substantial premium for exclusive association with the Olympics and the use of the protected symbols are part of their marketing campaigns. Consequently, anti-ambush marketing measures ‘are essential to protect the commercial value of a sponsor from being diluted with those who seek to associate themselves for free.’ Whilst the symbols and mottos are protected the London Olympic Games and Paralympic Games Act 2006 implemented a London Olympic Associate Right. This is a new Intellectual Property Right which is unusually strict and prohibits any unlicensed person from making a representation that may be associated with the games. It is imperative that the Olympics be properly and effectively funded to prevent it from becoming what was described by Boris Johnson as ‘an endless drain on the taxpayers.’ It is the vast funding by such corporate sponsors as McDonalds and Coca Cola that enables this to be achieved. Staging and sustaining the Olympics is an extremely expensive and high-risk venture; without the investment of these global brands it is unlikely that the Olympic hierarchy would be able to generate sufficient revenue to execute the event to the standard expected. An exorbitant amount of tax-payers money would have to be incurred and smaller businesses would be unable to sustain the financial slack to promote the global platform of this unique event, given our current economic circumstances. Restrictions have gone far beyond what was imposed in the past and maybe more than is totally necessary, but with the difficulty in policing new forms of social media which are constantly evolving, coupled with the current economic climate where substantial investments from corporate brands for sponsorship are critical to prevent excessive use of tax-payers money, taking such precautions to guarantee a high degree of exclusivity is not only fundamental but also enables the Committee to keep their promise and establish good relationships with corporate brands. Striking a balance in terms of enforcing the copyright laws is essential, but there will always be examples of ‘Olympic Brand insanity’ highlighted by the press. One example quoted was the threat of legal action against a florists displaying the Olympic logo made out of tissue paper. LOCOG issued clear guidelines as to what was deemed acceptable and what indeed constituted an infringement of the agreed copyright laws and stated their intention to resolve any issues amicably; Rio should follow suit. It must be accepted that despite attempts to prevent exploitation of the Olympic Association Right, the global nature of the Games and the value of association that it offers means that not all advertisers will be deterred and those that are ‘sufficiently creative may find novel methods of legally circumventing the rules.’ However, the priority still needs to be in delivering a high quality Olympic event whilst ensuring profitability which can be utilised to fund a sporting legacy after 2012 and the same can be said for Rio 2016. The strategic approach adopted by LOCOG secures this by allowing Global sponsorship and local business to co-exist within the copyright framework, and by enforcing a less draconian approach in Rio to favour smaller businesses, undermines the commercial importance of intellectual property rights and exclusivity.